Here's a little video Dr. Brady Haran, creator of the highly popular YouTube channel Sixty Symbols, put together to demonstrate our work on little swimmers. Drift times are negligible & micro-swimming is energetically expensive - discussed more in the Swimming Droplets section. Time-symmetry is self-defeating - Purcell's Scallop showed that an additional consequence of the viscosity dominated microscopic world is that a time-symmetric swim-stroke (one that appears the same when viewed in reverse) will move the swimmer forwards and backwards equally, and no net-motion can be achieved. Diagram's from Purcell's original lectures on his now infamous theorem. The latter is an interesting complication, which most micro-swimmers get around by the asymmetric beating of flexible filaments. 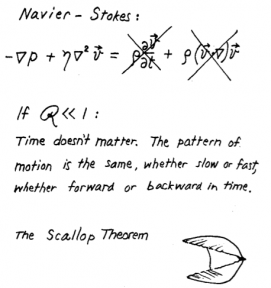 Clearly symmetric strokes are mechanistically simpler for life to evolve (or a micro-roboticist to devise) than asymmetric strokes, so pondering the above theorem poses the following question - when does the inertia of the fluid become sufficient to render Purcell's Scallop irrelevant? At what Reynolds number do time-symmetric swimming methods become possible? In this research, we devise a novel artificial swimmer: two spheres connected by a spring. We arrange the size and densities of the spheres such that one sphere is lighter than the fluid, and one is heavier, but the total density is matched, so it neither sinks nor floats. We then shake the container at frequencies close to the natural frequency of the spring so that the swimmer periodically stretches and contracts. The sphere with the greater inertial mass (which is necessarily the lower sphere in the equal size case, but can be switched to the top sphere when the sizes are mis-matched) then moves with a lower amplitude, and pumps the surrounding fluid to a lesser extent. Intuitively, if one sphere is beating harder, we would expect this to generate motion, but the beating is time-symmetric, so necessarily cannot induce swimming at zero Reynolds numbers. We sought to answer the question: does a tiny non-zero Reynolds number induce a tiny amount of motion, or is there some finite value at which a change in the structure of the streaming flows induces motion. Our results suggest the latter, where time-symmetric swimming begins at a Reynolds number of around 10 - the kind of condition that insects such as the water-boatman would experience, and is associated with a shift from steady laminar flows, to vortex shedding. Diagrams of the flows driven by our "little swimmers". On the left, relative motion, but no swimming. 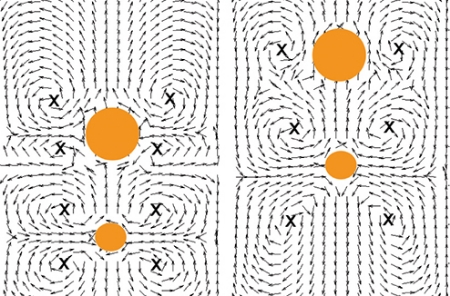 On the right, a noticable absense of one of the pairs of circulating flows, and upward swimming. This research has been covered in Physics Today.